It’s that back to school time of the year again and we can hear the school bells ringing already! It’s barely two weeks to resumption here in Nigeria and if you are anything like me you don’t want the holidays to end , yet you are secretly feeling excited that the kids can go back to school and you can have a little breather . Although it can be so hard to adjust from the restful slow days of holiday to the busy and fast days of the school year , but the reality is that the first day of school will be here before you know it and you definitely want to be ready when it comes. The more prepared you are , the easier and more fun it becomes . Let’s dig into eight important things you need to do to get in the back to school mode fully and start this school year off on an amazing note.. I usually get cracking on that lengthy school supply list early , sometimes as early as just after the holiday starts , because four weeks holiday is not forever and buying school items along side paying school fees doesn’t work well with me if you get . Back to school clothes or uniforms , Socks ,Tie : For returning students , check for items that needs to be replaced totally , bad zippers to be fixed , slacken sock that needs replacement etc .With new school starters , uniforms may be sold by the school (As is the case with my kid’s school) or gotten from a different source in good time before school starts. Lunch Box and Water Bottle : I advice you take the kids with you when going to buy this to show them how to open and close it and ensure they can do this with ease before buying it , reason is (1) You may not be able to return or exchange it if you change your mind (Nigerian Factor) . (2).You do not want food and liquid spilling all over books and clothes if it’s not closed properly bearing in mind that a teacher will more than likely have at least 15-20 children in their class and really won’t have the time to open and close lunch boxes and water bottle for each and every one of them. You want your kids to be as independent as possible all day long. Shoes : It is important that these are practical options. Velcro Straps are my go to option for school shoes any day because Adam isn’t patient enough for his lace up shoes and Asher can’t even tie them by himself . I advice you double-check with your kid’s school to ensure you buy what is compliant with their dress code. School Bag : Sturdy , durable , washable/wipe-able are my watchword when choosing a school bag. I also check the padding around the strap so that it is comfortable to wear. I am not a fan of wheely bags because they can cause tripping hazards and they are sometimes too cumbersome for younger kids to deal with. Groceries, Snacks and Food List : What is school resumption without grocery and food shopping anyway. It is important to stock up on items you will need for their lunch or snack box . If you follow me on instagram and snapchat you will remember my back to school haul / Market day where i showed y’all where and what i was buying in preparation for school resumption . I suggest you make a two weeks balanced food list ahead of time after which you can now recycle and change things up a bit .This is because waiting to decide what to fill their lunch bag with every morning can be such an overwhelming chore especially if you have picky eaters and not a lot of time on your hands. The days of going to bed later and sleeping late are fading fast. Children needs a lot of sleep especially in the early back to school days . At least one week before the first day of classes bring back bedtime a little earlier , this help the kids ease into the early wake up days and help ensure optimal school performance . This may initially be a struggle trust me , Adam has been watching TV till late through the holidays , now he get literally grumpy when I say he has to sleep early . 3. School Fees : This is the one thing to not leave till last minute (when kids are going back to school) especially if your kid’s school require payment before school resumes (i mean they are running a business eh). For me its almost like if this is not sorted then skip all other steps except you have chosen the home-schooling path . Depending on how many kids you have to pay for and the total value of the fees , i advice that a school fees trust / plan account be opened where you can set an amount to put aside every month (either from your salary or business profits) towards paying school fees so that the pressure and anxiety can be reduced whenever the payment is due. There are immunisation requirements for school entry to maintain high vaccination coverage and protect school children from vaccine-preventable diseases . Although some schools arrange for immunisation officers to come and immunize children while the school is in session , my advice is to make appointments to get your children immunized before school resumes especially if they are babies just starting crèche (for moms going back to work) or toddlers starting preparatory classes. 5. Update Contact Details : It is essential the school has up to date contact details for you (the parent/guardian) and an emergency contact incase you cannot be reached . It also does a lot of good if your kids know your number by heart .Adam can recite my phone number even in his sleep and he’s been singing it to his brother lately that Asher has also caught the first 7 numbers (Hehe ). 6. Notify The School Of Any Medical Conditions : To ensure your child get the full support they need to learn , the school needs to know if there are any medical conditions of concern so that ugly situations can be avoided. Adam is allergic to eggs, and nuts which is as a result of his skin conditions as a baby . This has been made known to the school and they in turn inform every of his class teacher and the school chef to ensure there are no mistakes or oversights. One of the most valuable things one can do to encourage the children to get back to school is to read with them and encourage them to read widely . Also depending on their age it is important to establish some well-defined academic goals and hold your children accountable. The path to achieving this includes but not limited to : paying attention in class, taking the time to carefully complete homework assignments. Did you find this post helpful? Are there other things you do to prepare for your kids for school ? I’d absolutely love if you’d subscribe to my blog leave a comment below, share on twitter or facebook and pin to your pinterest board for future reference! Bloglovin , Instagram ,Twitter ,Facebook for updates. Waoooooo such a great tips, God bless u.
OMG this takes me back! Great tips my friend! Lovely.. all ‘i’s dotted and “t”s crossed darling.. Such a great piece to remind me monday is here already ?? thanks for stopping by ope!we are ready for monday!!! This is such a fabulous and very helpful list! As a kindergarten teacher in the inner city of Providence and as a mom I can honestly say that you thought of everything!! These are such great tips! Going back to school can be so overwhelming for parents, so this list will be so helpful! Thanks Val! !i know studying can be a tough one but yes we can!!! Thanks a lot!you can go ahead and repost!!! These are all such great tips for heading back into the school year! Very well thought out and covers just about everything! Hello friend! Thank you for these tips! As a guy who has a 6 year old nephew I found this list very insightful and helpful. What a great post and very helpful! When the time comes and I have my children I hope I am very detailed with what is needed when we head to school, thank you for sharing. I know the Moms, Dads, Guardians, and Teachers are loving this post; again very helpful. PS Love the family photos! 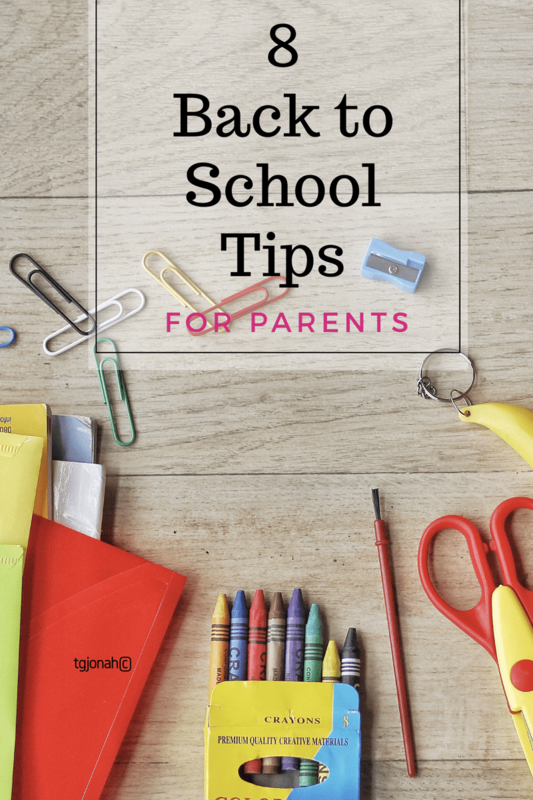 So many helpful tips for parents when their kids are back to school!